You’ve decided to take advantage of the Havasu seller’s market we’re experiencing right now by putting your home up for sale. However, you don’t want it sitting on the market for too long wondering why your home won’t sell. Home Staging Resource recently conducted a survey of more than 4200 professional home stagers. Survey results showed that 85% of homes that were staged sold for as much as 25% more than unstaged ones. Use these quick home staging tips to get your Havasu home sold quicker and for possibly more money. One of the first things to do on this list of quick home staging tips is to clear out your clutter. This ranks high on your “honey do” list before you list your home. Decluttering means removing most of your tchotchkes and personal items. But it does not mean leaving naked walls. A few low-key pieces of artwork, a couple dozen well-placed books, a few plants, and a couple of vases enhance the look of your room without overwhelming it. Also, take out oversized furniture. Keep it in storage off-site for the duration of the sale, if possible. Then, clean, clean, and clean some more! Scrub every nook and cranny of every single room until it sparkles, including windows, countertops, baseboards, and ceiling fans. Don’t put your furniture “under arrest”. Believe it or not, shoving every piece of furniture up against the wall makes a room feel more crowded. Create conversation areas with groupings of chairs, a table, and a lamp. Use area rugs to help frame each space. Downsizing and minimizing furniture also helps create the feeling of a larger room. 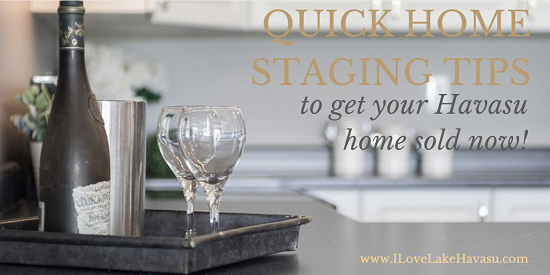 Another one of my quick home staging tips involves your accessories. Yes, you may use them…but sparingly. Keep your background neutral. Feel free to use one or two bright hues to add a pop of color in each room. Keep the same palette for a cohesive look throughout. Throw pillows, vases, and decorative bowls incorporate easily into any room. Professional stagers recommend grouping objects in odd numbers (three or five similar objects or colors, but no more). Finally, a well-placed mirror adds light to a dark entryway or room. It also makes a room feel larger. You can purchase cheap mirrors at your local big box store and add a beautiful frame to make it appear more luxurious. Use different shapes and sizes to add eye-catching appeal. Place them across from windows to reflect the natural light flowing within. If hiring a professional isn’t in your budget, use these quick home staging tips to make your Lake Havasu home as appealing as possible to potential buyers. When you’re ready to put your home on the market, contact me. Take advantage of the hot Havasu market right now. Give me a call today!